Today I’m sharing with you five easy DIY window treatments. Window treatments can be expensive, but luckily you can make your own at a fraction of the cost. Window treatments are used to dress up windows and are completely customizable to fit your home and your style. They add a framing effect to make your window and the scenery behind it stand out. 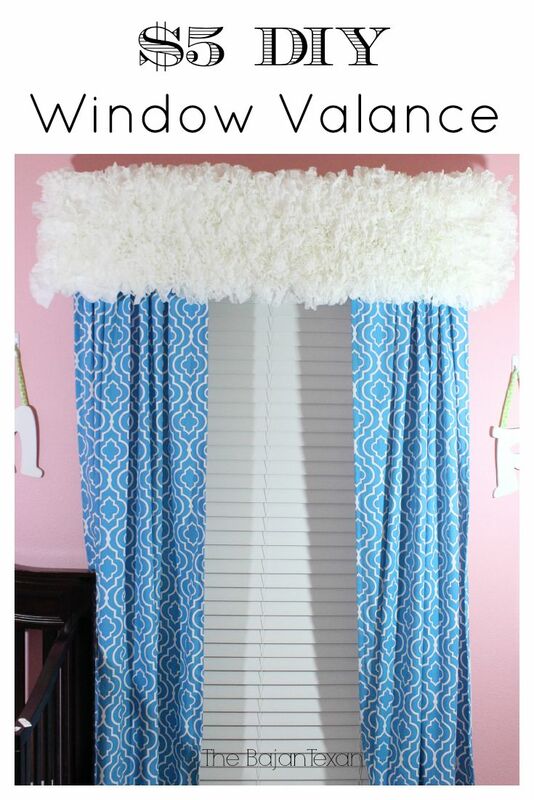 You guys loved this DIY Window Valance tutorial I made from coffee filters. It doesn’t get any cheaper or easier than this for a custom look. 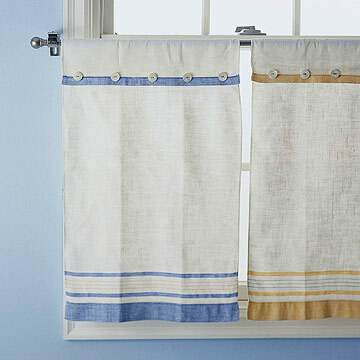 To make really simple DIY window treatments, especially for your kitchen use dish towels. You can easily find some that complement your kitchen’s style and scheme for pretty cheap. Then pick up some drapery clips and a curtain rod. Simply hang up the rod and use the drapery clips to hang up the dish towels. They’ll give your kitchen a very homey and classic look for a low price tag. While you can certainly buy curtains that are already striped or have designs on them, DIY painted curtains are easy and less expensive. With some white fabric or pre-made curtain panels and a little paint, you can create stunning DIY curtains that will give your room and your window a whole new look. To paint stripes or a chevron pattern on your curtains, use painter’s tape to block off the sections you don’t want painted. Make sure the curtains are laid out completely flat and iron out any wrinkles before painting. You will most likely need to do at least two coats of paint to cover the curtains completely. Once your curtains are completely dry, hang them up and watch them as the light hits them at different times to day so you can see any imperfections you may need to touch up. 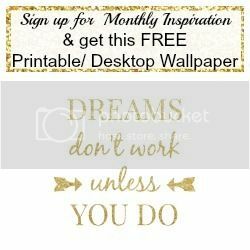 If you have a wallpaper design that you love but can’t see yourself using it on an entire room or even a full wall, put it on a window shade. It’ll be like a work of art with a built-in frame. Use a shade that rolls from the front (a reverse roll-shade) for the best results. Cut the wallpaper so it fits the shade to be flush on each side but leave enough on the top and bottom to wrap around. Depending on what type of wallpaper it is, you may need to mix your own wallpaper adhesive. Be sure to follow the manufacturer’s guidelines if you do need to mix your own. Adhere the wallpaper to the window shade using a credit card or pasting brush to keep the wallpaper completely smooth. Let the adhesive dry. Then hang the finished wallpaper shade and marvel at its beauty. 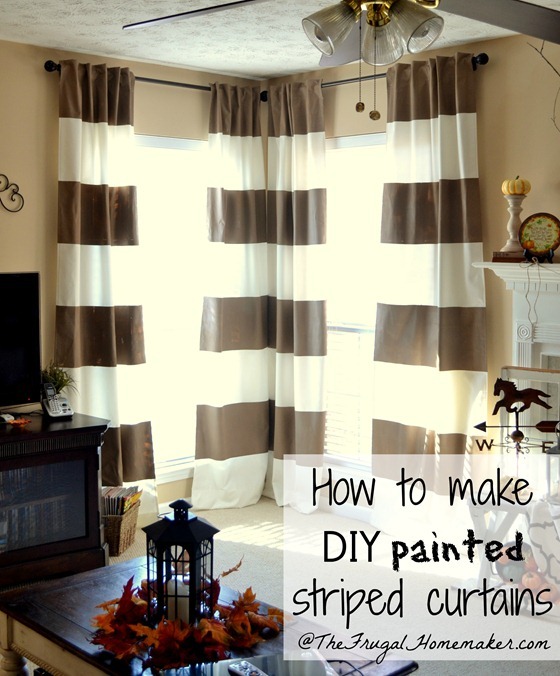 Yet again, paint can be used to transform fabric to make elegant striped curtains. 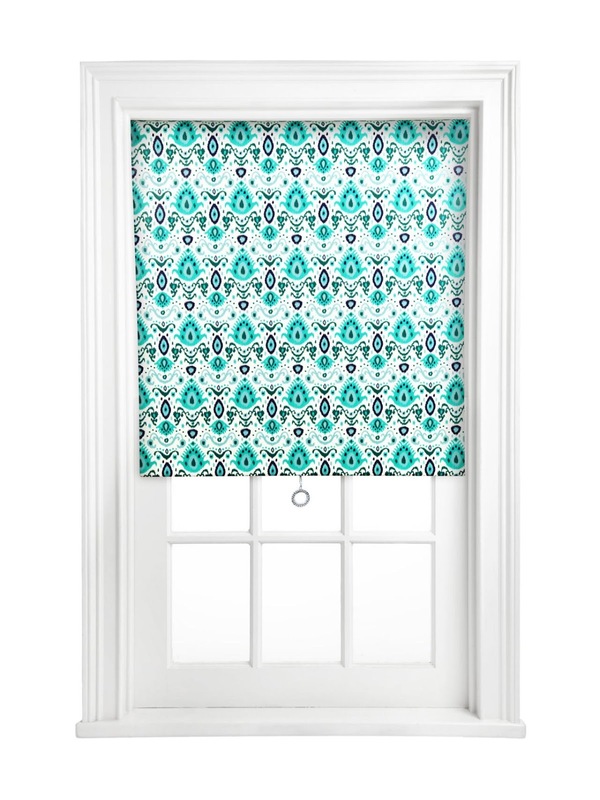 Your imagination is the limit when it comes to creating your own custom DIY window treatments. Get creative! Instead of using traditional curtain material, consider burlap for a rustic look or an old, frilly dress for a girl’s room. Once you make one yourself, you’ll want to dress up every window in your house! Article written by Kelly Mahan, also a writer for interias, a company that connects homeowners to reliable and professional contractors for their home improvement projects.